Take the fear out of budgeting with our step-by-step guide to crafting a budget you can really live with. Before you do anything take a deep breath and relax. . . feel better? We’re not here to make the perfect budget, or change your financial world overnight. We’ll get to that later. For now we just need to put a budget together that we can work with. There will be plenty of time to reflect and make changes later. The most important thing is to just get started, keep going. It’s best to budget with the information you already know. Most often this is either your past spending habits, or your current income. Both are great ways to start a budget so don’t fret over which one to pick. A budget based off your past spending looks at how much you currently spend and assumes you’ll continue to spend the same way. This method works best if you want to learn more about where your money goes and don’t need to stick to strict limits based off your income. Start by finding records of your past spending and organize it into categories you want to track. You can find your past spending history by looking through your financial records, such as your credit card or bank statements. Once you’ve organized your spending, use that information to create your Envelopes with budgets in EEBA. Don’t worry about the numbers for now. If your records show that you spent $150 on “Groceries” last month, create a “Groceries” Envelope and give it a budget of $150. You’ll have time to reflect on these numbers later. When you’re done, move on to Step 3. below. A budget based off your income proactively assigns a role for each dollar you make. It’s a great way to manage your money, and it’s also the best way to make sure you’re not spending more than you make! A good rule of thumb is to use a 50-30-20 breakdown for your budget. Start with your after-tax income –the amount that goes into your bank account each paycheck– and break it down into three parts. 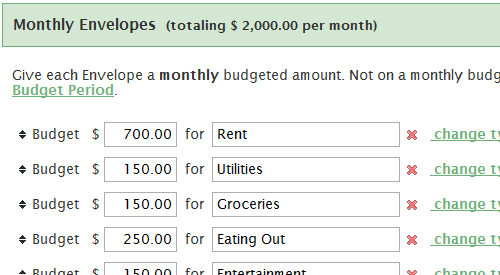 50% Needs: Expenses you have to pay, like rent, utilities, and groceries. 30% Wants: Expenses you choose to have, like eating out, and entertainment. 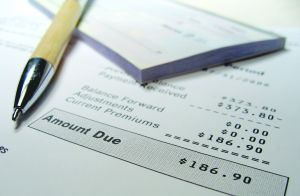 20% Savings / Debt Reduction: Money you save, or are budgeting to pay down existing debt. So, if you take home $2,000 a month, set a budget that allocates $1,000 to your needs, $600 to your wants, and $400 to your savings or debt reduction. When you’re ready, head over to the Edit Budgets page to create regular Envelopes that fit this budget. What Envelopes make up each of these categories will vary depending on your personal circumstances, but if it helps feel free to use the Envelopes mentioned above as a starting point. If you’d like more help creating categories to fit into a 50-30-20 budget, you can check out this helpful site by MSN Money which suggests some spending categories for you. Now it’s time to step back and take a broader view of your budget. Think about the whole year instead of just one month. What do you spend on once or twice a year (like Christmas Gifts and Car Insurance)? Make Annual / Irregular Envelopes for those expenses. If you used Option A and based your budget off your past spending, take a moment to reflect on your spending and decide if there are any changes you’d like to make. Maybe you’d like to spend less on eating out, or more on that hobby you wanted to get into. Use your budget to help you make those decisions. If you used Option B and based your budget off a percentage of your income, give the hard numbers you ended up with another look to see if they make sense. You may need to spend more than 50% of your income on your needs, or maybe you can’t afford to spend 20% on savings at the moment. Don’t worry about it, but keep your general goals in mind as you adjust your budget to fit your life. Also, if you haven’t already, consider making room for giving or generosity in your budget. Being generous with a portion of your money can often take the stress and worry out of managing the rest of it. As a final check, make sure you’ve planned to spend less than you earn. If not, adjust some of your Envelopes to make your budget fit within your income. Step 4. Give It A Try! Congratulations! You just finished setting a budget. You might not be sure about some of the numbers you see in your budget right now, don’t worry about it! You can always change your budget later. Now it’s time to put the number crunching away and just starting using your budget. Fund your Envelopes! Enter your expenses! Enjoy real-time sync between your mobile devices! Have fun! That’s great to hear, thanks! The 50-30-20 is very helpful by keeping me focused on where my money needs to go. Thanks. Heeeyyy….So I don’t have a fixed income. My budget is dependent on the current schedule at work which and my sales from my personal business. Sooo….what do you do with that? I have physical envelopes that have percentages in it (savings 10%, Tithe 10%, Debt payments 10%, fun money and gas 20%, Invest in my business money 30%, etc.) What would you do with that a) with your app and b) with creating a budget? I’d recommend contacting us at [support at eebacanhelp dot com] for specific questions, but let me answer your question while we’re here. If your income varies substantially, I would base your budget off your expenses following “Option A” above. That should give you a sense of where your money is going now, and may bring to light specific areas that need attention. 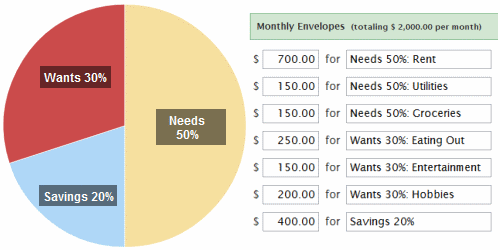 Using percentage based Envelopes with a variable income may not make sense. Let us know via e-mail if you have any other questions. Good luck! Excellent advise, specially the one to track expenses and savings altogether, thanks for the ideas, will put them to use. how would you say eeba compares with quicken? I have already purchased quicken but I think I like the sounds of eeba. This software is very helpful indeed! Thanks EEBA & more power! I clicked the link to find out more categories according to MSN Money and it is a bit outdated…. I think? This way of budgeting looks great! Thanks for catching that! I’ve updated the link. Certainly is a great way to see where it goes and where to tighten up the purse strings on unnecessary spending….